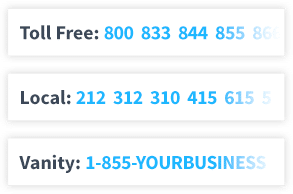 Select a toll free phone number in any toll free prefix (800, 888, 877, 866, 855, 844, and 833) or choose a local business number in any area code. Use your auto attendant to greet callers and route them to any combination phones, employee extensions, department extensions, or voicemail. An auto attendant phone system from UniTel Voice is managed completely online and allows you to run your business using your existing phones (cell, home, office etc.). An auto attendant system gives small businesses the power of a traditional business telephone system without the need for hardware or software. With an auto attendant from UniTel Voice, any business, on any budget can look, sound, and operate like a Fortune 500 company. 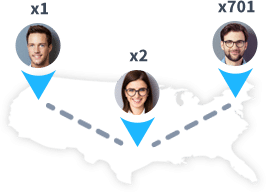 Your automated attendant works as a virtual receptionist that keeps you connected to your team and customers no matter where you are or where you go. 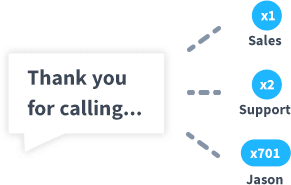 When a call comes your auto attendant greets the caller and routes them to the proper department extension, employee extension or unavailable message. With an auto receptionist from UniTel Voice, you can choose to use an 800 number to give your company a national presence. You can select a toll free number in any toll free area code including 800, 888, 877, 866, 855, 844, 833 or choose a vanity phone number that’s easy to remember. You can also choose to use a virtual local number from any major city in North America as your auto attendant’s primary telephone number. Using a phone number with an area code people recognize can give your company a local presence. You can even use multiple local phone numbers for a multi-location presence. Why Get an Auto Attendant from UniTel Voice? UniTel Voice is one of the cheapest and easiest-to-use auto attendant phone systems available. We offer affordable plans for every budget. All auto attendant plans include the same amazing features and 100% USA-based support to ensure your phone service is up and running fast and easy. 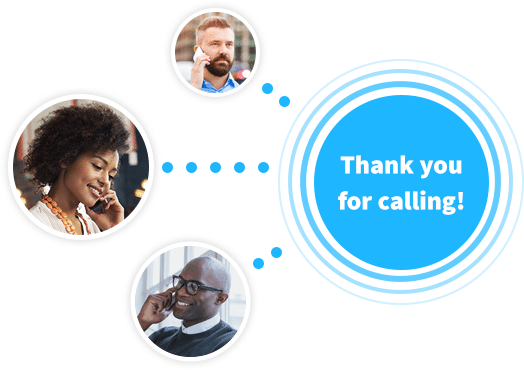 UniTel Voice uses an industry-leading network with world-class reliability to keep you connected, so cheap phone service doesn’t mean low call quality. Every UniTel Voice plan includes a free high-quality recording from a voice talent of your choice, so your auto attendant greetings always sound professional. 1. In total layman’s terms, what the heck an auto attendant? An auto attendant (also called an automated attendant, auto receptionist, or virtual receptionist) is phone system’s voice menu greeting that allows callers to be routed to extensions without going through a human telephone operator or receptionist. UniTel Voice’s offers a virtual auto attendant as part of a complete virtual PBX phone system priced and designed for small business owners and startups. 2. How much does auto attendant software as a service cost? Traditional (on site) automated attendant systems that required you to maintain hardware and update software cost thousands of dollars. However, since the dawn of virtual phone systems, the pricing and complexity of auto receptionist have dramatically declined because there’s no equipment to upkeep and no software to update. Here at UniTel Voice, you can get our auto attendant app with unlimited extensions, greetings, users, and voicemail for as little as $9.99/month. 3. Can I customize my auto attendant phone system? Yes, with UniTel Voice you can set up your auto attendant to greet and transfer calls to any combination of phones, extensions, or voicemail. 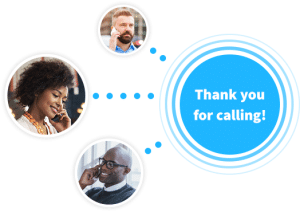 Your auto receptionist can forward calls to cell phones, home phones, office phones, smartphones, softphones, or IP-phones or directly to an unavailable greeting if your business is closed. And because UniTel Voice is a cloud-based business phone system you can make changes and manage everything online or via smartphone app 24/7. 4. Will UniTel Voice help me set up my virtual receptionist? Yes, in addition, our help desk with FAQs, and how-to videos, we offer free customer support from real people. You can chat with a real person online or by phone and we’ll help you get up and running fast and easy. We’ll even set things up for you, help you come up with an auto attendant phone script and get your greetings recorded via our professional voice talent studio at no extra charge. This concierge service is absolutely free with UniTel Voice. And everyone on our customer support team is based right here in the USA. No outsourced overseas call centers like the giant phone companies. 5. Does UniTel Voice’s auto attendant work with Google Voice or Skype? Looking for an auto attendant Google Voice solution or an auto attendant Skype for business solution? We can help. With UniTel Voice you can set up your automated attendant to forward calls to your Google Voice number or your Skype for business phone number. However, if you’re using a virtual phone number from Google Voice or Skype and then forwarding that number to your cell phone, you might not need to keep Google Voice or Skype in the equation. UniTel Voice’s auto attendant app can simply take your business calls and messages and send them directly to your cell, home or office phones. In other words, you can use your personal cell phone but still keep personal and business calls separate.